Most Fringe shows have two problems: a weak script and a lack of polish. It’s to be expected– the Toronto Fringe Festival is as much about workshopping pieces and developing talent as it is performance–but it’s often disappointing when promising ideas or actors end up stuck in a show that isn’t very well-written or wasted in one with poor execution. 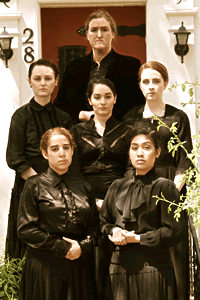 Randolph Academy, by digging out Federico García Lorca’s The House of Bernarda Alba, has completely avoided the first problem, and the production (running at the Annex Theatre) gets dangerously, fiendishly close to avoiding the second. The House of Bernarda Alba tells the story of a newly-widowed woman, and the lengths to which she goes to keep her five daughters cloistered and protected from the outside world. The daughters, expected to suppress their fears, lusts, drives and hopes, burrow deeper and deeper into the hot, sweltering house and fester in their own juices until an explosion becomes inevitable. Let me be clear: I liked it, and there’s a lot to like. The performances of Denise Norman as the deranged Maria Josefa and of Ellie Posadas as the emotive Magdalena are the standouts, but the whole company does excellent work with the material. The movement pieces–hat tip to choreographer Suzanne Liska–are impressive and flow naturally with the text. Jareth Li, the lighting designer, also deserves credit for his work–particularly the final scene, which features one of the most striking lighting effects I’ve seen in a Fringe show. The only problems I’d tease out feel minor by comparison. The accent work is inconsistent, with some actors aiming for Spain, others staying in Toronto, and one or two who get halfway to Spain but seem to have run out of gas somewhere over Quebec. A few lines were flubbed, and a few others were unclear. There are some moments which seemed poorly-suited to the Annex’s unforgiving theatre-in-the-round setup, and an awful lot of cheating goes on. More than anything else, it feels like this show desperately wants to be at least half an hour longer. The movement and stage business in this piece are truly wonderful, the performances are solid and consistent, and it stays with you afterwards. What more could you ask for in a Fringe show? The House of Bernarda Alba is playing at the Annex Theatre (794 Bathurst, box office and entrance are in the parking lot). Showtimes: July 04 — 08:15 PM; July 06 — 03:00 PM; July 09 — 10:15 PM; July 10 — 04:00 PM; July 11 — 05:15 PM; July 13 — 12:00 PM; July 15 — 07:30 PM. Photograph: Top to bottom, left to right: Darlene Spencer; Ann-Marie Banski; Amanda Testini; Sophie Mercer; Ana Lia Arias Garrido; Ellie Posadas.